Welcome to our New York City Guide at Map Online. New York City is one of the most popular destinations among American and International, leisure and business travelers. In this guide, we will provide you of all data you need in order to plan a visit to New York. We will cover multiple topics from which are the must-visit places to how to move around, where to eat, stay, how is the weather and much more. This page should be taken as a summary; We have placed links in each part to in-depth articles about selected topics of choice. New York is considered a “global city” since the end of the XIX century. It has very powerful influence in media, politics, education, entertainment and arts. New York City is constituted by five boroughs (Bronx, Brooklyn, Manhattan, Queens and Staten Island). Manhattan is one of the most significant financial centers of the world, home of Wall Street and many organizations in the finance industry. Let’s start having a look at the city icons. Yes, New York is well known for icon’s. You will find a map at the end of this page, with all icons we will cover. Statue of Liberty. Also known as “Liberty Enlightening the World” or “La Liberté eclarant le monde” (in french), is one of New York’s most famous landmarks. It was a gift from french during 1886 in commemoration of the centennial of the Declaration of Independency. With a weight of 156 tons between cooper and steel, it stands over a 25,500 tons concrete base. 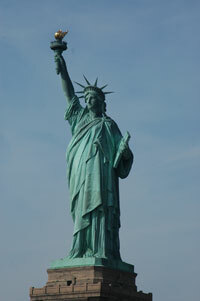 You can visit the Liberty Island–where the statue is located–taking a ferry from Battery Park. Ferries run approximately every 30 minutes from 9.30am to 3.30pm in winter and until 4.30pm the rest of the year. You can check the actual schedule. Tickets with access to the Fort Wood section of the statue cost $18 for adults, $14 for seniors over 62 years old, $9 for children between 4 and 12. Childs up to 3 rides for free. Empire State Building. Famous New York skyscraper built in 1931. It is now the 2nd tallest building of New York (1st place is for One World Trade Center, the new building built after 9/11 attacks). The Empire State is considered one of the seven wonders of the modern world. It has 102 stories and 73 elevators. Its observation deck is open to visitors from Monday to Sunday 8am to 2 am. It’s recommended to visit early morning or late night to avoid crowds. Tickets cost $27 for adults and $21 for child’s. It is located in the intersection of 5th and West 34th Streets. Brooklyn Bridge. New York’s most famous bridge and a must-see free attraction in your trip. With almost 6000 feet it’s construction ended on 1883 as a direct link between Brooklyn and Manhattan due to the increasing Brooklyn population that needed to commute to their jobs in Manhattan. It is now also a tourist attraction and thousands of visitors take pictures of the bridge on a daily basis. There is no admission and you can cross it walking, running, in a car, train or bus. Central Park. Its the greatest public urban park located in the center of Manhattan. With more than 36 million visitors each year, it’s without a doubt one of the most iconic landmarks of New York. The park was created in 1857. Having 840 acres it means you could put almost 8 Vatican cities over Central Park–that’s pretty amazing by itself. Looking for a walk? Central Park should give you enough trails to complete years of jogging without getting bored by the same view. There are plenty of things to do in Central Park and lots of them are free. Times Square. It’s a major and emblematic street intersection at the heart of Manhattan, Midtown. This famous crossroad in located between Broadway, 7th street and 42nd to 47th streets. It’s one of the most visited of Manhattan and a focal point of theatres, restaurants, subways and street food. You wont probably leave New York without a picture of yourself there–or probably two, one taken during the day and the other in the night. New York Transportation System. Probably one of the most complex public transportation systems. We are talking about Subway, Rail, Bus, Bridges and Tunnels, all managed by the Metropolitan Transportation Authority (MTA). You will be able to visit any tourism landmarks quickly and efficiently using this huge transportation system. When I travel to New York, I use the subway system most of the time. I keep a New York Subway Map with me that comes handy when walking or you can just plan ahead through the MTA website, a paper map or any major mapping tool like Google Maps. Moving around New York ain’t cheap. You will pay $2.50 for one way ride using any combination within the network. Of course there are ways to save: if you plan to be there for close to seven days, you will take advantage of the 7-day unlimited card for $30. You will break-even at 12 rides in the week but just making one round trip per day you will be at 14 rides. If you make 2 rides per day, you will be far in the savings area. My recommendation is to plan your stay and figure out the attractions you will like to visit and where you will be located. Based in that two factors, you will be able to make a good guess of the number of rides you will need during your stay and which of the options is the best for your case. Restaurants. New York is well-known for its cultural diversity. You will perceive this walking down the street and looking at the diverse culinary offer available. From hot dogs to Sushi, Italian, Chinese, fast food, options are available for every paladar. Don’t think just restaurants. Of course, a fancy dinner at a top restaurant in Manhattan is remarkable, but a New York trip will not be complete without trying street food. And we are not talking about just hot dogs, you will be shocked by how the street food market has evolved in recent years. Today you can find food from different origins, from quick and easy to elaborate on many street food trunks in the streets. Entertainment. You probably heard before about the city that never sleeps. After visiting what the city has to offer regarding attractions you will probably end up in Broadway in the night, attending one of the many plays the theatre district has to offer. Are you up for some music? Jazz show’s, pub’s, disco’s, street music and a lot of top notch musicals awaits across the street. Weather in New York dramatically changes with the season. From lower 20’s snowy winters to high 90’s sunny summer–A/C dependant–day’s. I personally like all but summer; Spring and Autumn are the best of the best as the temperature is mild and there is room for almost every type of activity without worrying about weather. But then winter… winter is special in New York. If you are ok with the chill, I recommend you visit New York in the winter at least one time in your life. The combination of snow, holiday season, ice skating rinks… it’s difficult sensation to transfer, you should experience first hand. We hope you find this New York Guide interesting and that it helps in some way the planning of your next visit. 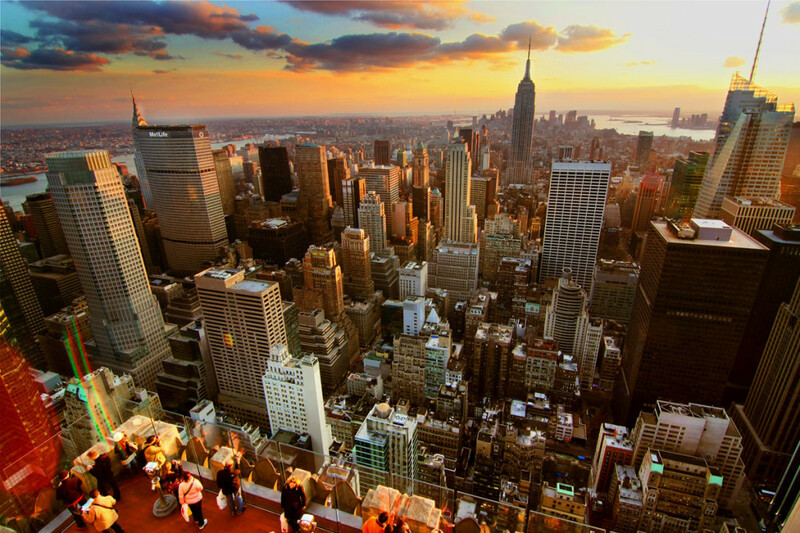 We love New York and is without a doubt one of the most remarkable destinations within the United States.